Knowing something of saddle tree construction together and understanding of the general conformation of the horse makes it possible to determine the gullet size and bar angle requirements a factory produced saddle must have to fit the horse properly. This approach has worked fine for our horses and should work for most horses. One does not always have to take actual measurements or withers tracings although we recommend that be done in most cases. Full Quarter Horse Bars - A Successful Saloon Franchise? When we discuss Full Quarter Horse Bars, Semi- Quarter Horse Bars, Quarter Horse Bars or some other designation we're talking about parts of the saddle tree, it's construction and how it all relates to the horse in terms of proper fit. You don't have to be an expert on all the ins and outs of saddle tree construction to get a saddle that fits both horse and rider. Still, it's to your advantage to have a basic understanding as to how saddles are constructed. When someone talks about bars, gullets, flare and the like it's helpful to be able to be somewhat on the same page. There's a method to the madness of saddle tree design and it all comes together addressing fit to the horse, fit to the rider, and intended purpose. Let's delve into some of the basics of saddle tree construction and the relationship to saddle fit. 1. Think of the saddle as having two sides, top and bottom. The top part is designed to fit the rider, the bottom to fit the horse. 2. The foundation of the saddle is the tree, so named because most western saddle trees are made of wood. 3. You can think of the tree as having four main parts, the fork, bars, seat and cantle. You will also find the fork referred to as the fork/swell or pommel. 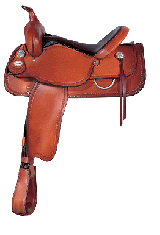 No matter the term, its the front part of the saddle and the cantle is at the rear. 4. The bars attach to the fork in the front and the cantle in the back. The bars are runners whose purpose is to distribute the weight of the rider evenly over the back of the horse. To accomplish this the bars are angled to come into contact with the horse over as much of the bar area as possible. The conformation of horses is such that the angle the bars have when joined at the fork is different than the angle they have when joined at the cantle. This is called the flare. The really critical measurement however is up front where the bars join the fork in the area called the gullet. The gullet is an opening which makes room for the horses withers. There are two parts of the horse that you do not want to have pressure placed upon, the withers and the spine or backbone. The width and height of the gullet must be such that no pressure will be placed on the withers (more accurately from directly above or from the sides near the top of the withers). The bars, as they run along the back of the horse are separated at the top by a channel. The channel serves to prevent pressure from being directly applied to the horse's backbone. Quarter Horse Bars - designed to fit narrower western horses which were commonplace up through the 1960's. These bars have a narrow angle. Semi-Quarter Horse Bars - horses got bigger and wider from the 1970's on, requiring a wider angle in the bars. Semi-quarter horse bars fit most of todays western horses. Full Quarter Horse Bars - our successful saloon franchises - have even wider angles to accomodate horses of Arabian stock or any other wider-bodied horse. These bars are also sometimes referred to as Arab,Arabian or Arab-Morgan bars. There are also "specialty" bars for breeds such as Haflingers and Draft Horses. Fits Miss Ivy just fine. Now it can get confusing. What some saddlemakers call a quarter horse bar, others will call a semi-quarter horse bar. I've seen Quarter Horse Bars also referred to as Standard Quarter Horse bars. To stay out of trouble just remember - is the horse narrow or wide or in-between? It's the same way with gullet width; gullet widths typically range from 6 1/2 to 7 inches with the former for horses with pronounced withers and the latter for horses with flatter or "mutton" withers. The gullet width should be about the same as the width of the wither's approximately 2" below the top of the withers ( in other words you want to avoid pressure on the withers on the top couple of inches). Now a good withers tracing will eliminate much or all of the confusion about bar angle, gullet width and the like and as we've said elsewhere, a good tracing is the best approach to achieving a proper fit. Still, it's nice to know these things. What the Spaniards used for saddle trees we're not sure. Something to research in the future. In any event the Spanish saddle was the forerunner of the Mexican saddle which in turn was the forerunner of the Western saddle. We can credit the Mexicans with perfecting the art of the hand-carved wooden saddle tree. Most quality saddles today are based upon wood trees covered with rawhide. The wood most often used is Ponderosa pine though I know of saddle makers who use cottonwood or poplar and in Hawaii the preferred wood for the Hawaiian saddle is from the koa tree. Trees made from synthetic materials, once frowned upon, have gained respectability, especially for the Trail or Pleasure Saddle. There are synthetic trees out there that are of questionable quality at least in terms of durability and for a working saddle, especially a roping saddle, most any saddlemaker will tell you to stick with wood. Other synthetic saddle trees like Ralide are of very high quality and, partially because of their lighter weight are gaining much favor with both barrel racers and pleasure riders. Finally, an old timer, the Wade Tree and Wade Saddle is returning to the scene. You can read about the Wade and why it is becoming so popular by Clicking Here. Stoecklein's Saddles of the West traces the historic beginnings of the Western saddle and the handiwork of some of the most famous early saddle makers. Modern day saddle makers build saddles for the real cowboys of the West who use them in cutting, reining, working cow horse, rodeo, and more. The images in this collection show off the skilled craftsmanship and creativity that goes into each one. Clicking on the Saddles of the West illustration will take you to Powells.com and further information about this book.